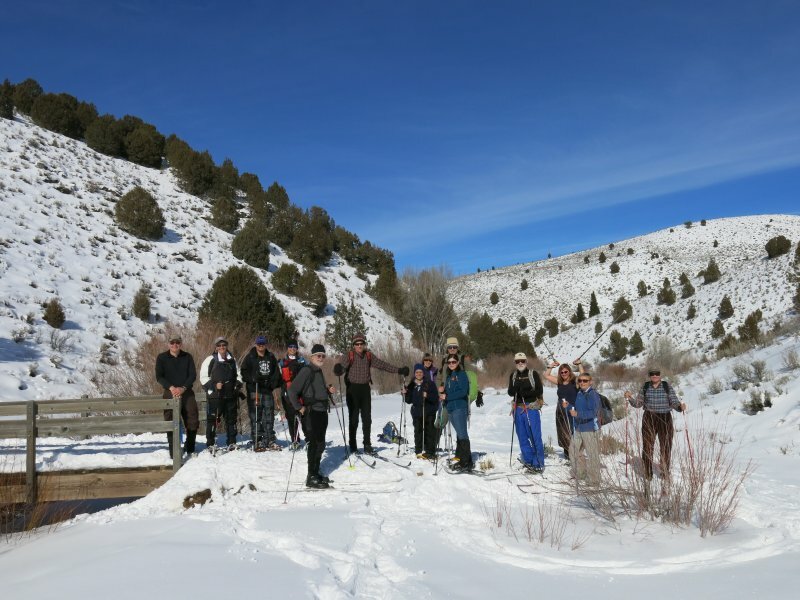 Fifteen Cache Hikers enjoyed this sunny, warm, excursion to Temple Fork. Alex, Stephanie, Jane, Terry, Jeanne, Deanna, Gordon and Joe used snowshoes, and Dave P., Dave W., Richard, Steve, Monika, Betty and Jim were on cross-country skis. Unlike last year, deep snow at the Temple Fork forced us to park at Blind Hollow, 0.3 miles away. 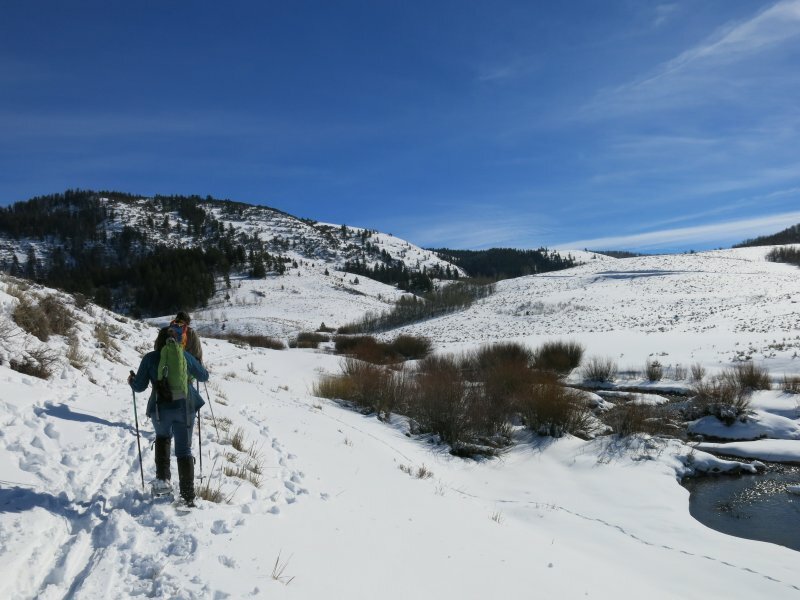 We managed to get most of our vehicles well off the road in spite of the lack of recent plowing here, but heavy traffic and limited space on the shoulder made for a uncomfortable roadside walk to Temple Fork. 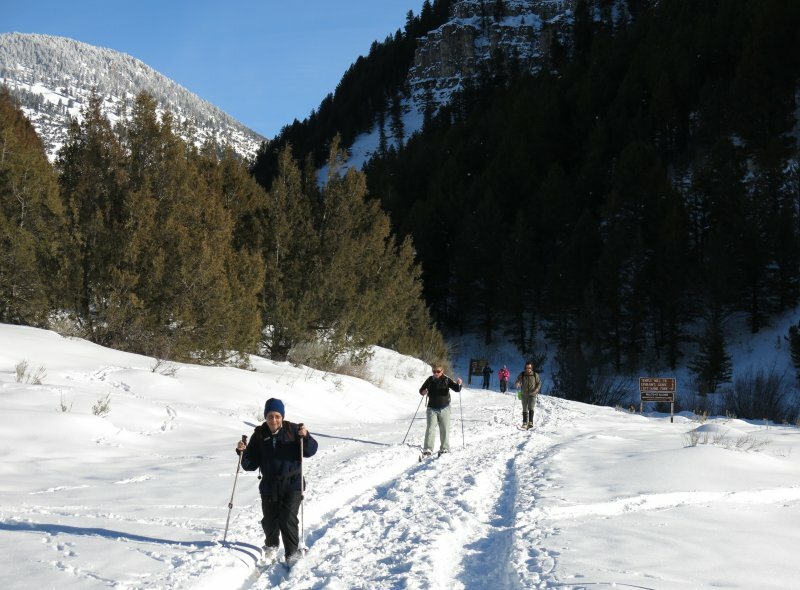 At Temple Fork, we donned our snowshoes and skis, crossed the Logan River and followed Temple Fork Creek as we traveled south on the Temple Fork Road. Surface ice crystals sparked in the sun and animal tracks added interest along the way. After one mile we came to the junction where the road heads up toward Ephraims Grave, but we stayed left, continuing up Temple Fork Creek on the Temple Fork Sawmill Trail. After another mile, we arrived at the footbridge over the creek, just in time for a lunch break in the warm sunshine. Most of the skiers took advantage of the break to apply glide compound in an attempt to counter the sticky snow conditions. Jane and Jeanne turned back after lunch, but the rest of the group decided to go farther, although this would prevent a timely return to Logan. We followed Temple Fork Creek another 3/4 mile, then crossed on the footbridge and climbed to the southwest, intersecting the Temple Fork Road about 1/2 mile further. 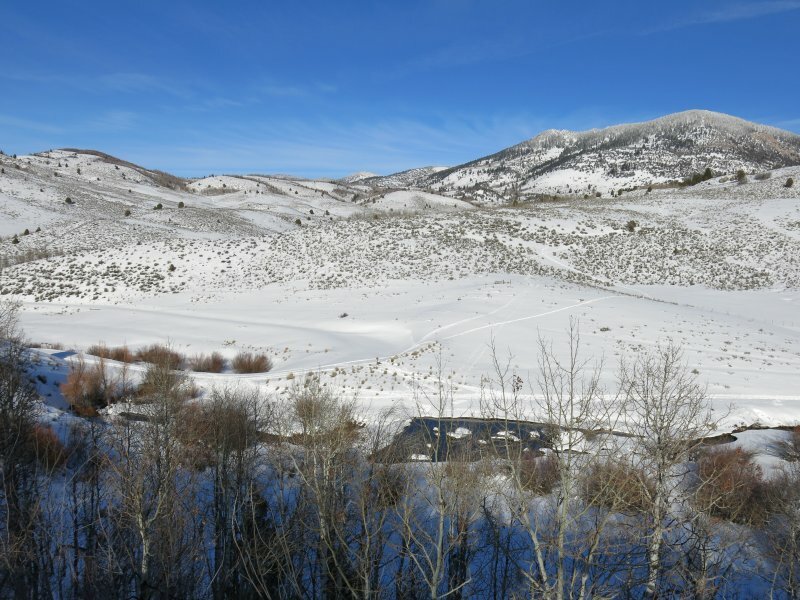 Then, we simply followed the road north for the rest of the trip, all the way back to the beginning, although Richard took a couple of downhill ski runs through the untracked snow below the road. Jane and Jeanne arrived at Logan by 3:00, as planned, but the rest of the group did not get back until 4:30. We were aware of a possible map error here, so we tracked the road using GPS, and sure enough, the satellite image confirms the error. Our GPS track on the map, below, seems to deviate from the road, but the satellite image (click here) shows the map error. Lunch at the first footbridge, about 2 miles up Temple Fork Creek. Our GPS track shows 7.3 miles, including 0.6 miles walking along the road to and from our cars at Blind Hollow.